RU/2: Harry Martin's OS/2oons: C. "OS/2 dead?" 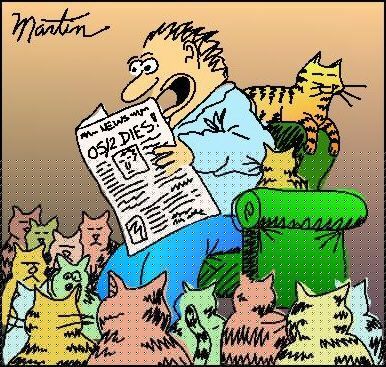 Harry Martin's OS/2oons: C. "OS/2 dead?" "OS/2 dead?... Naaa, it's got more lives than all my cats combined, and then some." "OS/2 мертва? Не-е-ет, у неё ещё больше жизней, чем у всех моих кошек вместе взятых."